Now I can't imagine what you thought I was going to blog about! But I'm not! No, I'm writing about some new arrivals in the Gill Family, and first of all comes these two chaps, seen above being cuddled by Fraser and Dylan. 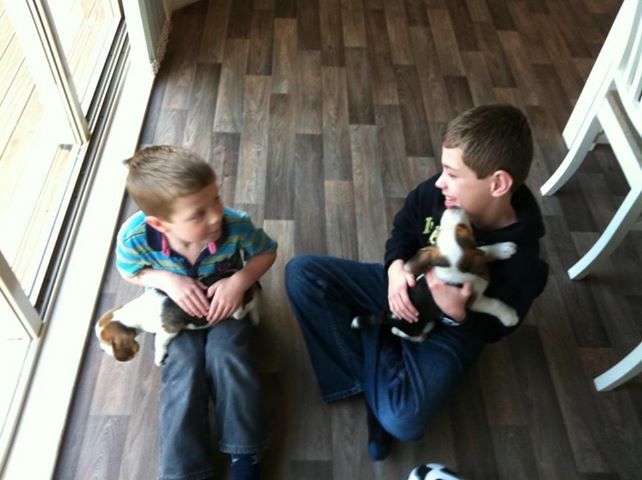 Two Beagle pups found their way into the hearts and home of Kit and family, and here they are, meet Frankie and Benny. Beccie has been agonizing for a puppy for years! Can you tell? Frankie and Benny in their small fenced in puppy run - or play-pen! Kit has wanted a Beagle for... oh I can't remember , years and years, but the time was never quite right. In fact even when we were out there this Winter his response was a firm NO! to Beccie's pleas. So when he changes his mind he changes it good and proper - two puppies are happier than one, he's read, so two puppies it is. They look gorgeous, and I can't wait until we go out there again and I can see them - though they will be full-grown dogs by the time we make our next New Zealand visit. So that's the biggest new arrival excitement, but Jim and I have had our own New Arrival! Yes! We have been delivered of a healthy little ...... caravan! Yes, me, a confirmed caravan phobic! But we have been talking about having some kind of permanent base in Wales near the river Jim fishes as often as he can get over there. We thought tents, but decided we are getting on a bit for tent holidays - despite my forays into tents at Molly Festivals! 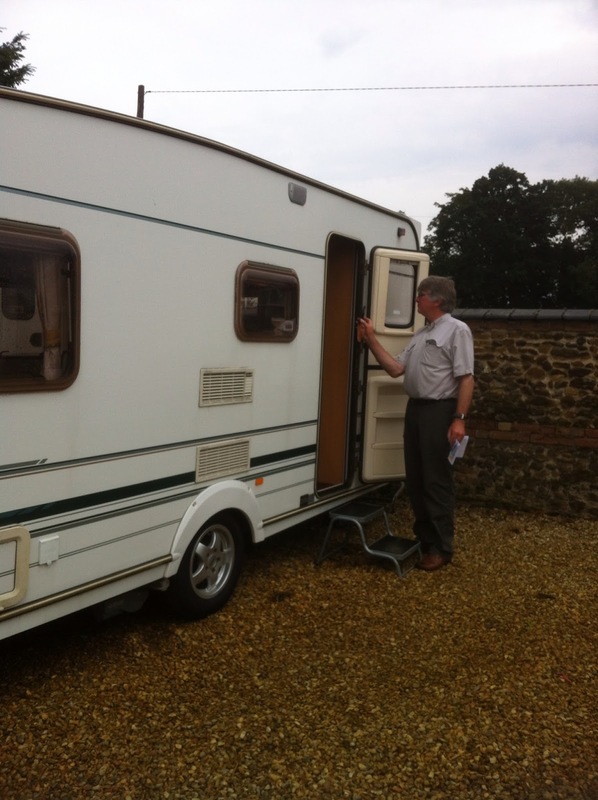 So we decided a small caravan on a permanent site, which we have been able to secure. I initially had wild dreams about turning it into my very own "Connie-van" which readers of Lucy's Attic 24 blog will recognise. But no, common sense prevailed. it ISN'T a vintage caravan, I think this is one instance where Jim would put his foot down quite firmly if I suggested I paint the inside in pretty pastels! It is in quite immaculate condition, so no excuse for ripping things apart and recovering, for instance. No, it will remain a 'grown-up' space, and I shall restrain myself, simply added some homely touches here and there. We are quite delighted with it and were just at the right place at the right time to snap this little gem up well within our budget. Lots of lovely plans going on at the moment, Jim will fish, I will stitch, read, walk into the village, catch a bus maybe to who knows where, and maybe even play a little music? And on the days Jim doesn't fish, we shall explore together. Sunshine or no sunshine!! Well, there you have it. New arrivals are so exciting, aren't they? Have you had any new arrivals recently? Erm, well, we aren't touring so we haven't really looked at sites .. it was determined by its proximity to where my husband fishes, so that clinched it rather. And we have nothing to compare it with... I guess you go on-line and check in the area you want to visit, and I think the caravan magazines do good reviews of camp sites. Good luck! Hi Ethel, site fees vary depending on various things - location (we are on North Norfolk coast and the site fees are higher here); facilities (the more the site has, the more you pay for); the time of year etc. If you logon to UK Campsite website, you will be able to search an area and see all the campsites in the area. Many sites listed have a website link so you can check the facilities and prices online. Also, if you join one of the main Caravan/Camping clubs, you will be entitled to stay on one of the 'certified sites' - these are small sites (around 5 touring pitches) which are cheaper than regular campsites. The more basic ones have fresh water, water and chemical disposal point only, which is often all you need if you use your own caravan toilet, shower and washing up facilities. If you add electric hook-up, showers and toilets you will pay more. Prices for certified sites can vary between around £8 and £15 per night, so make it very affordable. Regarding buying a caravan, I would recommend that you do lots of research (I always start online) and go to showrooms to see all the different styles of 'van. 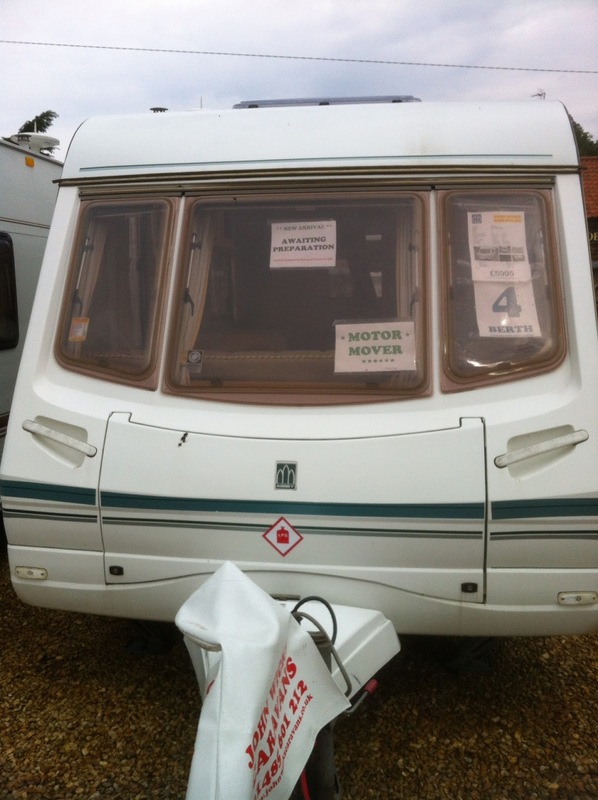 When we bought our motorhome we went to lots of local(ish) showrooms to look at the second-hand stock they were selling; ask lots of advice from sales staff on each site, they should not try to pressure you into buying something straight away. Ask people you know who own/have owned 'vans and just research as much as possible. 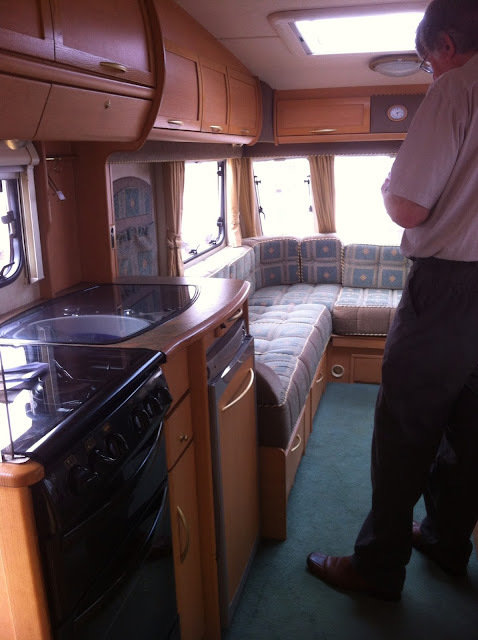 Ultimately, I think you will know when you have found the right unit, ours was actually the first model we viewed, although we did travel a little out of the local area to buy the actual 'van as it was newer and lower mileage. Best of luck and enjoy!! Thanks Alison, all good advice. How easy it is these days, to just go on-line to do your initial research, it gives you a good basis before you get out into the real world! My friend and her DB bought a caravan last year (with mosquito nets) and have gone on several holidays so far. Her DB had a 'how to tow a caravan' lesson before they set off which proved invaluable. At least you will only have to drive it once and park it which will be great. Well, in the space of a day Him Outdoors has gone from 'we'll have to get someone (nodding towards Suffolk where No.1 son lives!) to drive it over there for us.' to 'well I think I'll give it a go.' Who knows! I would rather poke myself in the eye with a blunt stick, frankly, but we'll see. If he DOES tow it himself, we might then do a bit more moving about, but it was bought with the main purpose of being a fishing base. 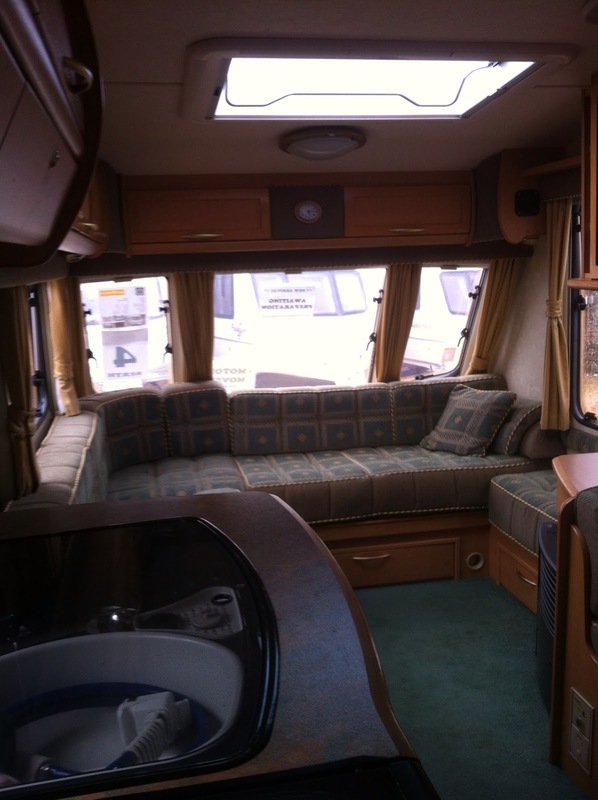 I can relate to your excitement about owning a caravan, we're still on a high about our campervan. Oh Lynne you are going to have such fun and its such a wonderful way to just chill out as and when you want to. You meet all kinds of lovely people too and everyone is so friendly. Enjoy your trips away. We are going to venture further afield this Autumn and make our way to Norfolk which we love, so watch this space! Those puppies look gorgeous too. Happy caravanning! Oh, lucky you! 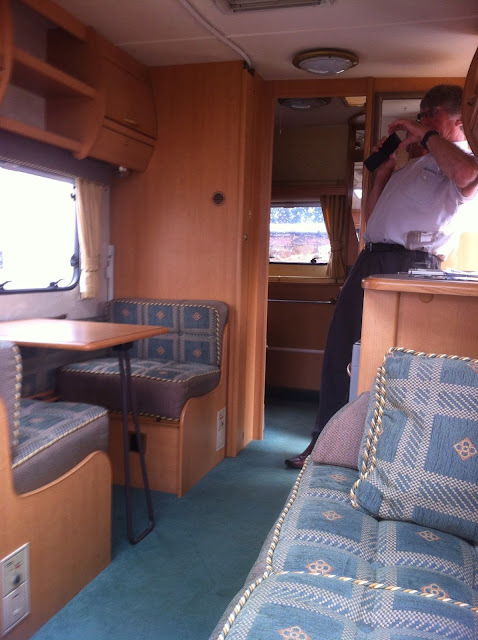 I've always loved caravanning but never owned one. It's a pity you couldn't make your first foray in it to NZ and see the new arrivals. They look adorable. If your base is in North Wales we could pop over and have a cuppa with you when we are on one of our frequent day jaunts to Wales. Email me re the felt and I'll give you my phone number and we can sort out what you need. Hi Jo, well, we would be in South Wales - near Abergavenny - well, nearer to Crickhollow, so a bit of a detour for you!!! But certainly happy to see you should you wander that far south!! How exciting for you all. I am not sure whether I would be more excited about the puppies or the caravan. I know how I felt when we bought our motorhome in September 2011, we used to go away virtually every weekend and within 6 months, we had decided to do a year long tour in Europe. We enjoyed it so much we have changed our lifestyle and now work on the campsite during the summer months to allow us up to 5 months off each year. Even if you are a fishing widow, you will love the relaxation of being away from home, it really feels like a 'proper' break. I still love it now, even though we are effectively living in our 'van, but oh I would just love even one of those puppies!!!! I have HUGE doubts,Alison, that we will be following your example!! But it does sound idyllic, I must say. I never worry about occupying my time while Jim fishes - plenty of stitching to do, exploring, journalling and I shall probably take my melodeon to play as well - gotta keep the practise up! I hope Dad has had a good look at the roads in that neck of the woods, I found a lot of them very tricky in the truck, and almost impassible with an artic wagon. I've always been ever so anti caravan, but the thought of taking to the hills in a camper of some sorts is increasingly appealing. I can quite understand the appeal of a place to escape to. Where in Wales will you be Lynne, perhaps we could meet up sometime? Hi Annie - yes, I've always been a bit that way myself, and would never have believed that we would one day actually own one ourselves - but there you are! Wow! that's a looooong way to drive for you!